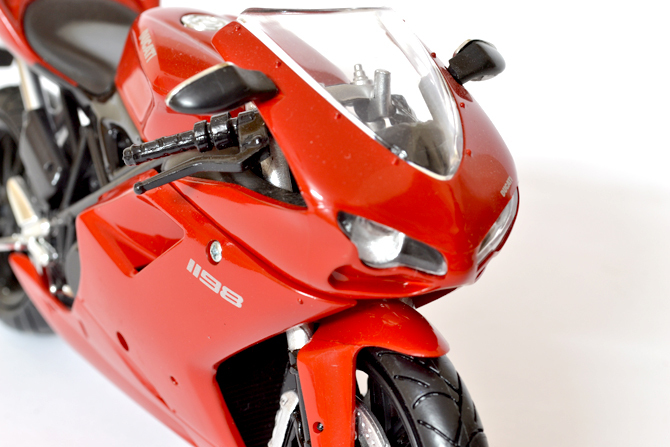 The Ducati 1198 is a sport bike made by Ducati to replaced the 1098. 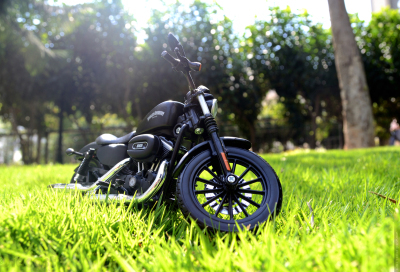 The deliveries started 2009 and the last bike rolled off by 2011. Ducati quotes this bike as “A bike that was designed by the track and engineered by the stopwatch”, which is not a exaggeration because it produces 170Hp at 9600rpm and 131.6Nm at 8300rpm torque! 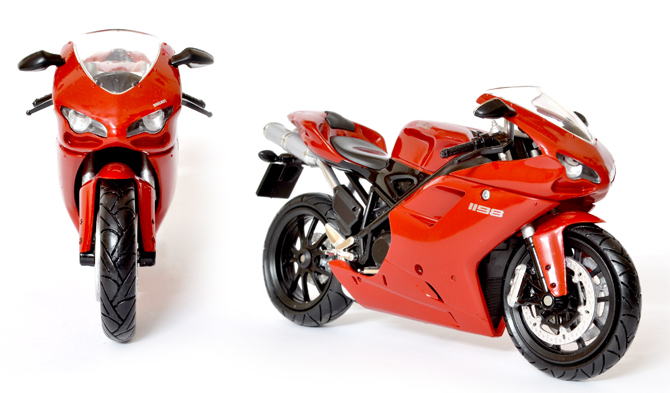 The 1198 shared design elements with its predecessor 1098, but has more power and torque, redesigned wheels, lighter headlights, traction control and lighter fairings. 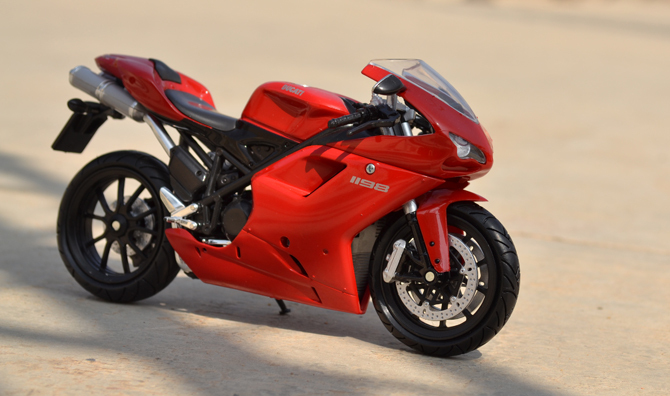 One carry over from its 998 heritage are the distinctive single-sided swingarm and non-integrated exhaust system. 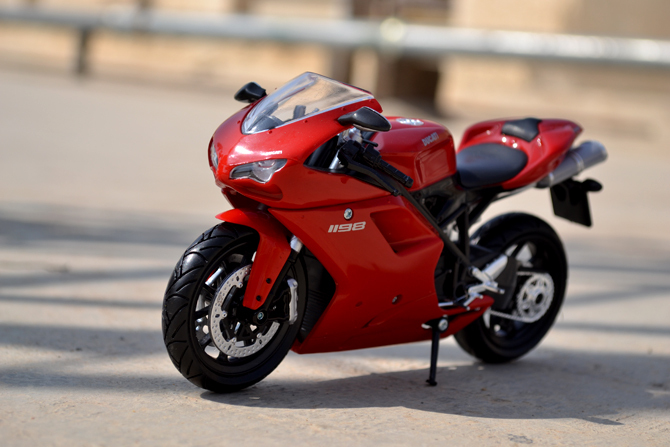 Ok lets get into the model that I in here… If you are regular visitor then you would by now know that I am a Ducati aficionado and take every opportunity/excuse to grab one! 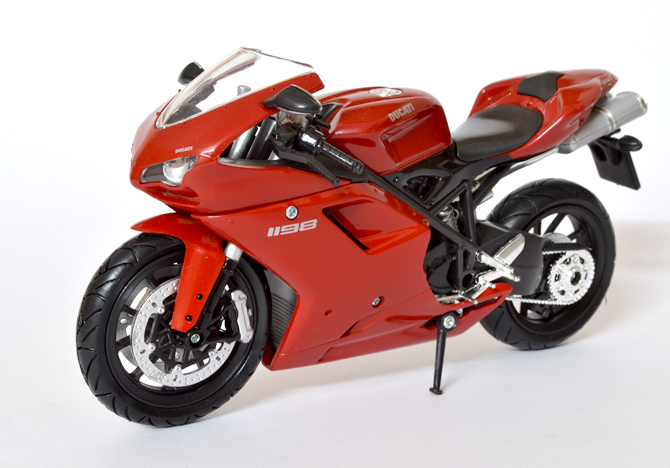 This time its a Ducati 1198 made by NewRay in 1:12 scale, its decent model which comes in a windowed box(mine was damaged in shipping) with some fancy graphics on them. 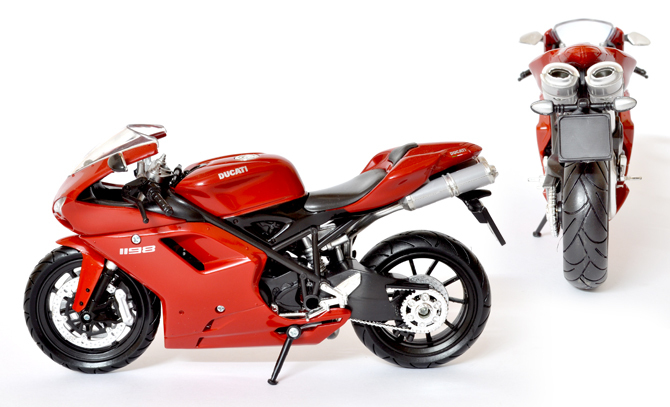 I like any Ducs in red, so as many around the world but its is also available in white if want that extra colour option. In my opinion this is a pretty good model for the price range! The NewRays are know for the details, which can be found in here as well. The materials used are at a lower end but that doesnt take away the fact that it is indeed a great addition! At 1:12 I dont know any other manufacture who makes 1198 so learn to live with the small flaws here and there. The paint job and the body work are awesome. 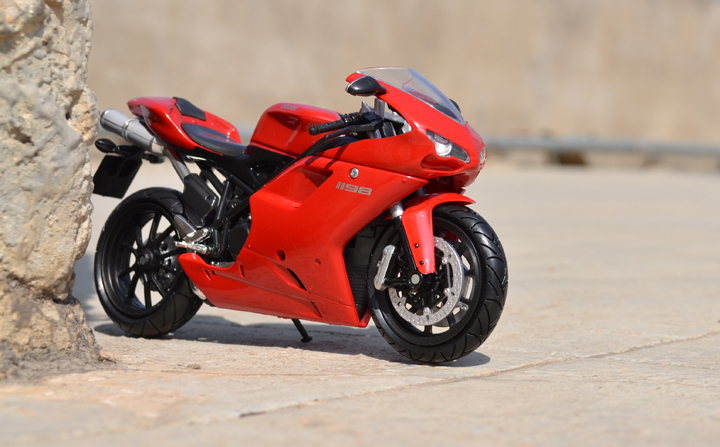 The colour might seem a little wineisn in real in room condition and look identical to the one under direct sun light an other typical Ducati schema. The black body parts, trellis frame and the alloy wheels look fabulous. The fit and finish is a sort of a concern as most of the parts rattle! at least in my model. The chrome bits scores a poor rating but here the good news it that this bike comes with very few chrome pieces so not a deal breaker. So its rating time! 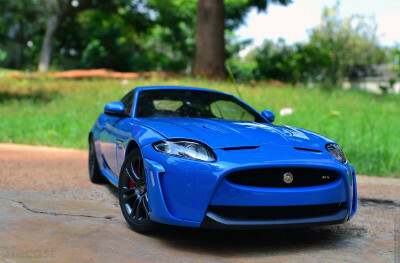 This model scores good on body work, paint finish and detailing(like the headlight optics, which are far more realistic that the likes of Maistos, Mondos etc.) 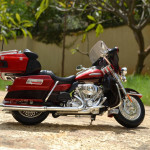 The downsides being the fit & finish, scaling and chrome treatment, which gives it a balanced rating at around 3 stars. This being the first month of the year I could not do a blast off outdoor photo shoot so here are some shots that are fired on this guy from our roof top. 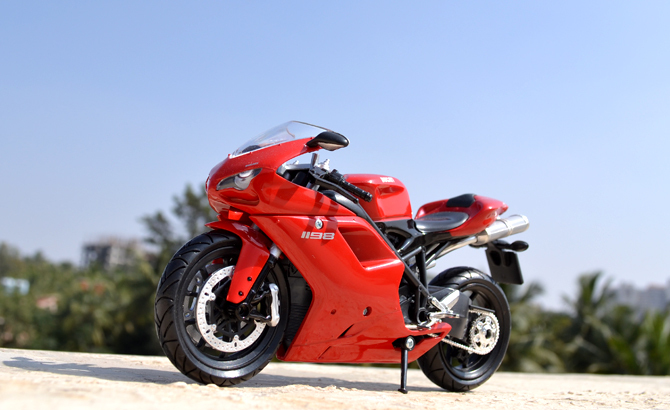 Ducati are always my favorite, love the 1198 . 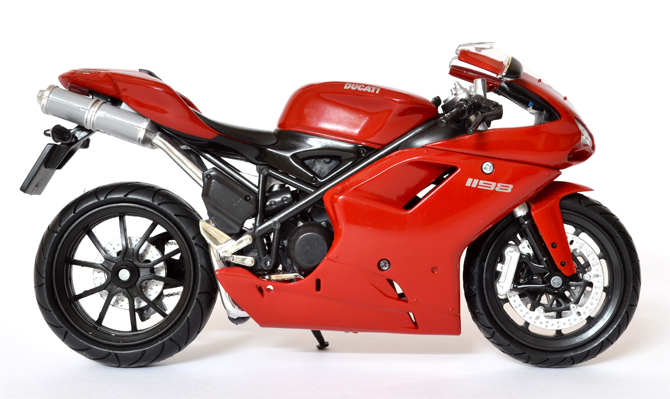 This 1198 is really well made and adds some serious value to my Red Ducati collection.. Absolutely right. I expect the base 1199 to be right arnuod the 18-19k mark, which puts it right on par with the BMW, since you really do want the TC and ABS. I imagine the 1199 in its base model trim will include some sophisticated electronic rider aids. It must, as I’m sure the boys in Bologna have their sights set squarely on that other Italian superbike manufacturer and their RSV4 that’s been getting so much press.I can’t wait to see the damned thing! I’m hoping it will be every bit as good as Ducati would have us believe.As for Buell, I would love to see him producer proper American superbikes for the masses but I too acknowledge that it’s going to be a while, if ever; the resources simply aren’t available to him. I laud the man for his efforts and, perhaps more than offering a mass market bike, I’d love seeing the EBR1190 competing on the world stage.